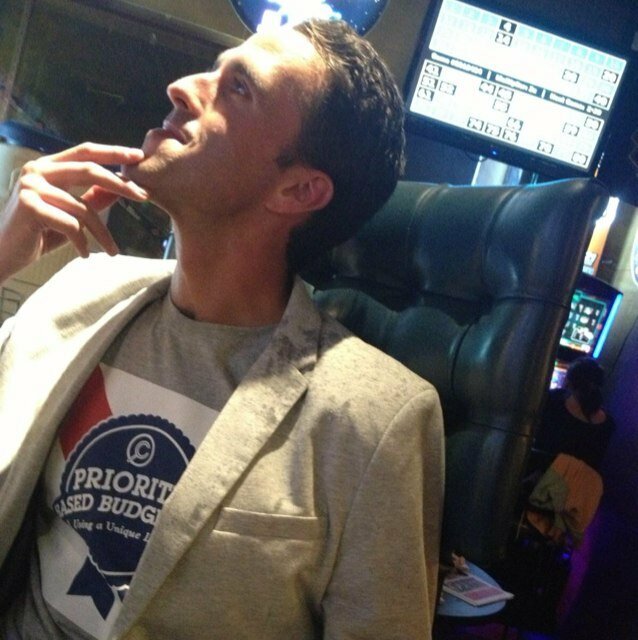 Chris Fabian ponders the present and future of the CPBB (Center for Priority Based Budgeting). Chris Fabian and Jon Johnson are the Co-Founder of the Center for Priority Based Budgeting (CPBB).Chris specifically has been a consultant focused on all levels of public entities about the fundamental business issues of local government. On August 4th-7th, 2015, the Peak Academy had the privilege of attending the CPBB’s annual (Un) Conference, which was held in downtown Denver. The event welcomed and showcased public employees from across the nation seeking to improve and share insights on the topics of financial literacy, innovation and priority based budgeting. 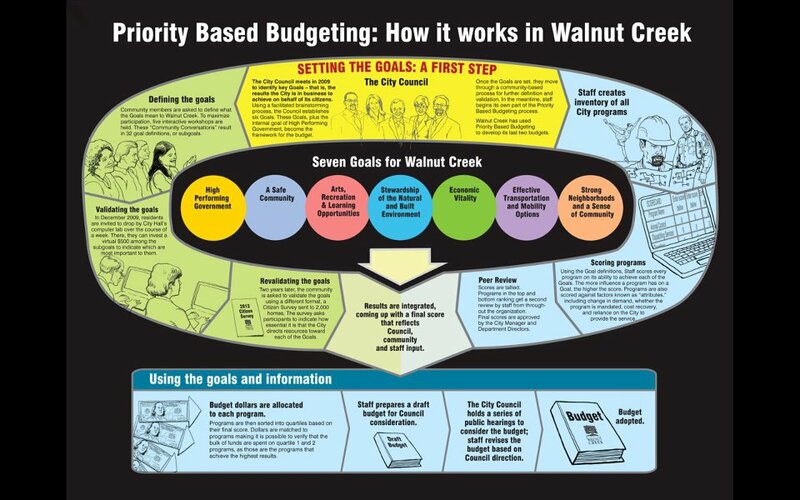 The Priority Based Budgeting Flow Chart (above): assumes rules can change and barriers can move if that is necessary to maximize results for the citizens. 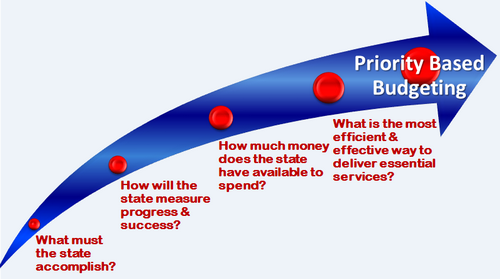 The steps of Priority Based budgeting prompt governors and legislators to ask four key questions at the start of each legislative session (e.g. what must the state accomplish?). 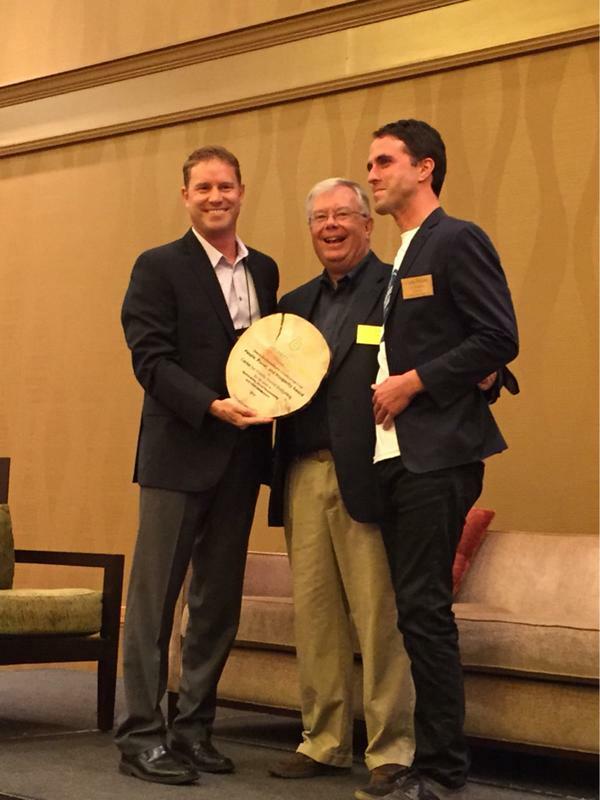 Peak Academy (PA): What was the goal of the 2015, Denver CPBB (Un) Conference and why? Chris Fabian (CF): The goal of the 2015 CPBB Data-Focused Communities (Un) Conference was to gather the brightest and most curious minds in local government to share experiences, ideas, and lessons in innovation and further propel excellence in governance. 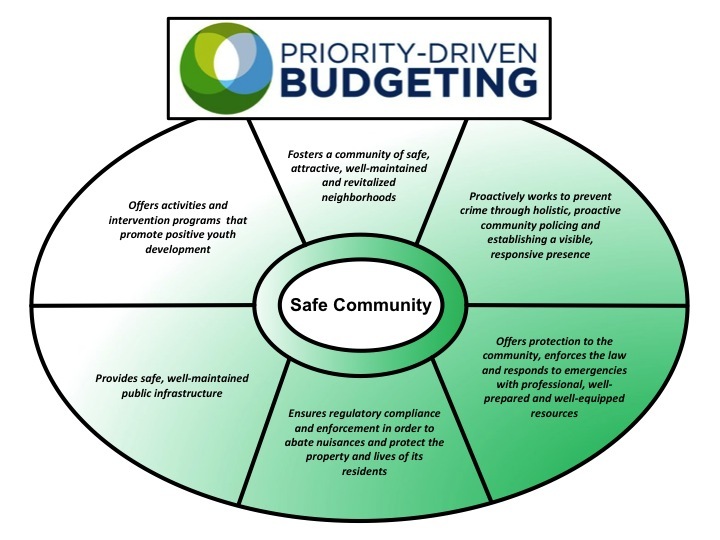 At the beginning of 2015, over 80 communities across North America have implemented Priority Based Budgeting (PBB), impacting over 11 million citizens across the US and Canada. By the end of this year, over 100 communities will be practicing PBB, using the process and tools to reshape the way all of a community’s resources are leveraged to achieve Results, and inviting citizens further into an authentic role of influence and participation. How We Achieve Safe Community: The Result Map (above) comes from the City of Cincinnati. Precision in Priority Based Budgeting depends on the clear articulation of the cause and effect relationship between a program and a defined Result. To usher in the future, CPBB has integrated its entire body of work into an online Fiscal Mission Control Center, synchronizing online Fiscal Health, Program Costing and Priority Based Budgeting to unleash the full potential of data-focused decision-making. With the evolution of CPBB’s work culminating in our Mission Control Center, we wanted to educate and engage local government leaders in how every community, regardless of size or location, can unleash the power of data-focused decision making. And while the evolution of our work is the cornerstone for data-focused decision making, many of our peers are also making giant strides in contributing to excellence in governing. We ultimately wanted to gather the best and the brightest local government innovators to provide the entire tool-kit of opportunities to local government leaders. To showcase how the most innovative local government leaders are benefitting the communities they serve through data-focused decision-making. And provide the resources and inspiration for those who attended to implement these concepts in their communities. PA: What would you consider to be the best part of the 2015, Denver CPBB (Un) Conference and why? CF: We pride ourselves in creating unique events every year. We call our events (Un) Conferences because we purposely make every effort to create an environment that is much more participatory than a typical conference. This year we had over a dozen sessions that were either led or co-presented by active local government professionals. Our philosophy is that while it is great to have private sector and non-profit professionals introduce innovative new products and concepts to local government leaders, it is equally (if not more) important to have local government leaders themselves, your peers, discuss how they have actually implemented these solutions in their communities. The power of experiencing how Centennial, Colorado successfully implements a very effective and successful public/private partnership program (P3), or how Strathcona County, AB (Canada) applies PBB scoring principles to capital projects prioritization to clarify decision-making, is explosive and inspiring. It is one thing to hear how (conceptually) innovative new trends can be implemented. It is much more effective and tangible, however, to hear how your local government peers are actually successfully implementing these concepts in their communities. PA: If you could go back in time and change one thing about the 2015, Denver CPBB (Un) Conference, what would it be, and why? CF: We are constantly listening to the feedback provided by (Un) Conference attendees and evolving our events so they produce the greatest value to our local government partners. We don’t necessarily have one particular thing we wish we could change about the 2015 (Un) Conference. We do, however, have every intention of propelling more and more sessions led by active local government leaders and creating more opportunities for these leaders and their peers to engage in rich dialogue during our events. The growth of the “user group” continues to excite us. Back in 2009, there was one user. By the time of our first (Un) Conference around 2012, we had 29 communities who had gone through the work. By the end of this year we’ll be over 100. It’s easy to understand that with more users, they want to learn from each other, to share their own triumphs and expand their experience base. On top of this, we’ve had several local government professional move from one PBB community to another, and so the richness of the community itself is growing. That being said, we plan to really expand the opportunity for users to truly have time to learn from each other, and that is really exciting! This engagement, based on feedback we receive each year, is the key differentiator and is truly what makes the CPBB (Un) Conference the unique and inspiring gathering that it is. Next Post DHS Found a Golden Ticket!